Tektites are naturally occurring holohyaline (wholly glassy and macroscopically homogeneous) droplets formed by the melting and ballistic ejection (and vapourisation and condensation) of silica-rich rock by cosmic impacts. The name tektite was first coined by Suess (1900) from the Greek τήκτος meaning molten. Whilst the 'core' meaning is unchanged, the precise definition of a tektite has necessarily evolved since this time and is not as clear cut as one might first imagine. There is a transition between tektites and other ballistically ejected impactites due to peak temperature of formation and source rock composition. The definition of tektites is reliant on multiple criteria, the boundaries of which must be defined, but which are not universally agreed upon. In order to properly define a tektite one must establish their place within the impact melt rock framework and compare and contrast other tektite-like objects. Montanari and Koeberl (2000) define distal ejecta as material deposited at a distance of over 5 crater radii, with proximal ejecta being deposited at distances less than 5 crater radii. Stöffler and Grieve (2007) offer a classification of ‘impactites’, which is a collective term for all rocks affected by one or more hypervelocity impact(s) resulting from collision(s) of planetary bodies. Impactites are sub-divided into shocked rocks, impact breccias and impact melt rocks. We are interested in the ‘impact melt rocks’, which are further subdivided by Stöffler and Grieve (2007) into glassy, hypocrystalline (part glass, part crystalline) and holocrystalline (wholly crystalline). Tektite-like objects fall into the holohyaline (glassy) and hypohyaline / hypocrystalline (part glass, part crystalline) impact melt rocks traditionally described as distal ejecta. The author prefers to replace the phrase 'distal ejecta' with 'ballistic ejecta'. Bodies should be classified on physical and chemical properties and not on distance from a (possibly undiscovered / undefined) crater. Of these tektite-like bodies a sub-division can quickly be made separating out the macroscopically heterogeneous Muong Nong-type layered impact glasses which formed 'bombs' from the macroscopically homogenous droplets principally controlled by cohesive forces (surface tension) See Table 2.1). These droplets can be collectively termed impact spherules. Impact spherules fall into two textural categories: Holohyaline (wholly glass) and hypohyaline / hypocrystalline (part glass, part crystalline). Glass and Burns (1987, 1988) formerly differentiated the holohyaline microtektites from the crystallite / microlite-bearing (hypohyaline to hypocrystalline) microkrystites. The principal control on whether an impact spherule contains cystallites, and therefore whether it is categorised as a tektite or krystite, is chemistry. Krystites are typified by a more basic composition, which may be derived from the source rock or by combination of meteoritic component. This more basic melt is inconsistent with optimal glass formation, hence the presence of crystallites / microlites. A krystite can be defined in the same was as a tektite: Krystites are naturally occurring hypohyaline to hypocrystalline (crystallites within a glass groundmass, appearing macroscopically homogeneous) droplets formed by the vapourisation and condensation (and melting and ballistic ejection) of silica-rich rock by cosmic impacts. a) Lechatelierite particles (SiO2 ribbons formed from detrital grains) would be expected in melts but not in condensates. Many individual microtektites do not, however, contain lechatelierite (Glass and Simonson, 2013). b) Melts may theoretically contain other detrital minerals, particularly in closer proximity to the source crater. Detrital grains are more characteristic of lower temperature Muong Nong-type impact glass melts. c) Bubbles / vesicles would be expected in melts but should be absent from condensates (some crystalline phases may be removed from microkrystites by dissolution, thus creating voids). d) Melts should contain rotational forms (spheres, dumbbells and teardrops) whereas condensates should be only spheres. e) Condensates should have lost a greater volatile content than melts. f) A detectable, but not obvious meteoritic component should be present in melts. In contrast, a more obvious meteoritic component is typically present in vapour condensates. At this point one has divided tektite-like objects into five principal categories: Impact 'bombs' (Muong Nong-type layered impact glass); melt-drop tektites; condensate tektites; melt-drop krystites and condensate krystites (see Table 2.1, principally based on Glass and Simonson, 2013). The final classification method employed by Glass and Simonson (2013) is a size division. All bodies are divided into either micro- (under 1 mm diameter), mini- (1 to 10 mm diameter) or macro- (over 10 mm diameter). If no suffix is applied one can assume the body is macroscopic (see Table 2.1). It is notable that the largest spherical melt-form tektite is 111 mm diameter and that elongate forms (dumbbells, teardrops) are typically around 160 mm in maximum length. Melt-form macrokrystites are not known, but might theoretically exist. Over geological time the tektites or krystites may interact with the host environment, resulting in alteration products. The tektite may still be recognizable as a pseudomorph, whereby the shape is maintained but the composition/chemistry is partially or fully altered. If it is still possible to determine whether the impact spherules are tektites or krystites then they could be called 'altered tektites' or 'altered krystites'. If the sub-division cannot be deciphered the the general term impact spherule is suitable for use in this case. If the origin of the spherule is uncertain (e.g. it might be volcanic of impact derived) then the more general term 'spherule' should be applied. Tektites are almost wholly made up of terrestrial rock, they contain a tiny amount of the impactor (around 0.5% might be a typical value). All macroscopic tektites (the type we are all familiar with) formed from the melting of silica-rich rocks. They are not products of condensation as evidenced by the presence of lechatelierite and bubbles. ABOVE: A table showing the key divisions of distal impact ejecta. After Glass and Burns (1987,1988) , Glass (1990, 2000) and principally Glass and Simonson (2013). * Indicates forms usually not present - almost all condensate spherules are significantly below 1 mm in size, but theoretically may exist. † Indicates not known to exist, but theoretically may exist. 1) Tektites are very poor in water (0.002 to 0.02 wt %; Montanari and Koeberl, 2000), except some microtektites which have undergone hydration (Glass et al., 1997). Volcanic obsidian typically contains an order of magnitude more water (Gilchrist, Thorpe & Senfle, 1969). Man-made glass may, in some cases, be comparable to the upper range of tektite water content (Gilchrist, Thorpe & Senfle, 1969). 2) Using major oxides, tektites (and other impact glasses) can be distinguished from igneous glasses by their higher MgO and lower Na2O for a given SiO2 content (Chacko and Glass, 1974). Generally speaking, more volatile components are reduced in tektites. 3) Melt-drop tektites typically have a very small extraterrestrial component (an often detectable, but not obvious meteorititic component). Condensate microtektites may have an observable meteoritic componet. Terrestrial obsidian contains no traces of extreterrestial component. 4) Melt-drop tektites (which include all macroscopic tektites) contain abundant lechatelierite (although not every individual melt-drop microtektite will contain lechatelierite). Condensate tektites and obsidian would not be expected to contain lechatelierite. 5) Tektites have a high silica content (essential to form a glass). Obsidians also have a high silica content. 6) Tektites are holohyaline (wholly glass) and with no crystallites / microlites. More basic impact melts will contain primary crystallites / microlites. Whilst these melts form spherules, the spherules are hypohyaline to hypocrystalline (part glass, part crystalline). As they are not pure glass they cannot be termed 'tektites' and are instead termed 'krystites'. All known krystites are microscopic. Terrestrial volcanic obsidian contains crystallites. A macroscopic sample containing crystallites would almost certainly be obsidian. 7) Tektites are uniform and macroscopically homogenous in composition, i.e. not layered. Muong Nong-type layered impact glasses and obsidian are layered. 8) Tektites have very low magnetic susceptibilities. They are not crystalline and iron is in a highly reduced state. In obsidian crystalline magnetite (an oxide) may occur. A strong rare earth magnet on a thread will not be deflected by a tektite, but may be deflected by obsidian. If the magnet is deflected, the body is not a tektite. (Lehman, www.tektitesource.com). 9) Tektite colour in transmitted light is often distinctive. The colours are related to the overall chemistry and reduced state of the iron. Australasian tektites are a distinctive amber brown, coffee brown, greenish brown, colour and fairly uniform throughout. Other tektites can be green to greenish brown (central European) and yellow to yellowish green (Libyan desert impact glass). The green to even slightly greenish hue is a good indication of tektitic origin, reflecting the reduced state of the iron. In contrast obsidian is commonly grey (a colour never found in tektites) or lilac-grey. (Lehman, www.tektitesource.com). 10) Tektites are ballistically ejected material. Obsidian is typically not ballistically ejected (and if so, low velocity). 11) Having been ballistically ejected and fully melted the morphology is, in part, controlled by cohesive forces (surface tension), thus forming droplets including spheres, dumbbells and teardops (the latter two induced by interaction with centrifugal forces). Condensate tektites and obsidian would not be expected to contain rotational forms such as dumbbells and teardrops. 12) Macro-tektites usually show evidence of aerodynamic forces during atmospheric exit, in the form of plastic deformation. Obsidian does not have a flight history like tektites and, as such, differ in morphology and sculpture. 13) Distal macro-tektites may show evidence of ablation on the anterior surface, formed during high velocity atmospheric re-entry. Proximal and medial tektites, together with obsidian, do not show evidence of ablation. 14) Proximal, medial and distal macro-tektites often show evidence of spallation on the anterior surface due to rapid cooling in the frigid upper atmosphere. Obsidian do not have a defined anterior surface and do not displayed spallation in an orderly or repeatable manner. 15) Tektites can occur at great distances from the source crater. Obsidian may also be transported long distances (hundreds of kilometers), but is considerably more limited geographically and cannot pass geographic barriers. Man-made glass may also be confused with tektite glass. Man-made glass comes in a diverse array of forms ranging from industrial waste slag, bottle glass, fly ash (from the burning of coal) to atomic bomb glass. Despite the diverse array of chemistries, man-made glass is usually distinguishable from tektites based on major oxide compositions. Man-made glass will not contain any meteoritic component and will not, except in rare examples, contain lechatelierite. It also has a zero geological age, immediately suggesting it is not impact derived (or is, by chance, from a very recent hitherto unknown impact event). Some man-made glasses can have a lower water content, comparable to impact glasses, but tektites typically have a still lower water content (Gilchrist, Thorpe & Senfle, 1969). Whilst microtektites may physically resemble some man-made glasses, macrotektites do not usually physically resemble man-made glasses. To conclude, if one reverts back to the original meaning of the word tektite, it was clearly originally applied to bodies falling into the modern category of 'melt-drop tektites'. Muong Nong-type layered 'tektites' are referred to as impact glasses in this publication as the macroscopically heterogenous bodies were never melted to a point where they formed droplets controlled by cohesive forces. The author considers this to be essential for the body to be termed a tektite. Condensate microtektites might, in some ways, benefit from a separate name as they represent the opposite end of the spectrum to Muong Nong-type layered impact glasses. They do not fall within the realms of the original term 'tektite', which was applied to melts and not vapour condensates. a) Whether Muong Nong-type layered impact glass is a tektite or not. The author would argue that whilst Muong Nong-type layered impact glass is genetically related to tektites, it was not heated to sufficient temperature to completely melt all detrital mineral grains, lose all volatile content, homogenise and was not a sufficiently runny melt to form isolated droplets controlled, in part, by surface tension. b) Whether tektites need to be distally ejected. Granted that most are, but one can find tektite-like objects that are ballistically ejected droplets composed of glass, but found in very close proximity to the source crater. Example of such can be found at Waber Crater, KSA (Mittlefehldt et al., 1992) and Lonar Crater, India (Nayak, 1972). Whilst one might be able to distinguish these on chemical grounds as they contain a higher meteoritic component (Mittlefehldt et al., 1992), they effectively fulfil all the criteria for being a tektite (or krystite). It would seem unjustified to define the same body as being a tektite (or krystite) if found over 5 crater radii away from the source (Montanari and Koeberl, 2000) and as an impact spherule if under 5 crater radii away. A body found out of context (or with no known crater) would not be able to be classified. c) With reference to Montanari and Koeberl (2000) tektites should '..occur in geographically extended strewn fields'. It is noted that some proven tektites, such as urengoites, are not yet associated with a strewn field, although undoubtedly a strewn field does exist. It is also dubious as to whether some tektite-shaped components of darwin glass, from Darwin Crater, Tasmania, and irghizites from Zhamanshin Crater, Kazakhstan could be called tektites. They are tektites by all other counts, just from smaller impacts. d) Montanari and Koeberl (2000) state that tektites '..seem to have formed from the uppermost layer of the target surface'. Whilst this might be basically true, as the tektite-forming event proceeds progressively deeper layers are 'sampled'. Note that high 10Be content in proximal Australasian tektites does not necessarily correlate to the uppermost layers as high 10Be concentrations can be found at great depth in areas with a very high sedimentation rate. The key defining features of a tektite appear to be that they are ballistically ejected by a cosmic impact; they were fully melted to the point that the melt was of sufficiently low viscosity to form droplets controlled, in part, by surface tension; the chemical composition of the source material was such that when quenched no crystallites/microlites formed and the body remained holohyaline (wholly glassy). It was correctly pointed out to the author by an astronomer that a meteorite is an object of cosmic origin found on the Earth. The term meteoroid is applied to the object before it reaches the Earth’s surface (it may or may not reach the Earth’s surface). Meteor is a term applied to the atmospheric phenomena of the meteoroid passing through the atmosphere. There is no equivalent to meteoroid/meteor in the tektite realm and effectively there is no need. A tektite passing through the atmosphere can be termed a meteoroid (producing a meteor) in its own right as origin and composition are not considered at this stage. Origin and composition are only considered in the classification process once the meteorite or tektite is studied, assuming the meteoroid makes it to the Earth’s surface and is not totally ablated away during atmospheric passage. One of the problems in terming tektites that are in ballistic flight as ‘meteoroids’, is that it blurs the neat (albeit artificial) line between space and the Earth. After all, if tektites can be called meteoroids, what about the much lower energy ballistic volcanic ejecta? Volcanic ejecta is of too low velocity to produce a meteor, but effectively it is ballistically ejected material the same as ejected tektites, but with a different lower velocity ejection mechanism. I would resolve the issue by subdividing meteoroids and meteors into extra-planetary bodies/phenomenon derived from beyond the planetary body (Earth) and intra-planetary bodies/phenomenon derived from (within) the planetary body (the Earth). In order to avoid confusion with meteorites in this work, the term ‘tektite’ is applied to the tektite body as found on Earth and also used in description of its atmospheric passage prior to its re-arrival on Earth, even though at this stage the term meteoroid might better be applied to the body and meteor for the bright streak of light or atmospheric phenomenon. All known tektites are ejected and deposited on the same planetary body, in this case Earth, and can be considered as intra-planetary tektites. Extra-planetary ejection, whereby the tektite is formed on one planetary body and lands on another is theoretically possible, almost certainly has happened on rare occasions in the geological past, but has never been genuinely recorded. Artemieva (2001) discusses the shocked martian meteorites ejected by impact. The existence of these is evidence that tektites could theoretically be ejected from Mars and land on Earth. These theoretical tektites can be considered as extra-planetary tektites. Tektites can form on any planetary body with suitable tektite forming conditions: Principally relatively large rocky planets that have or have had sustained igneous differentiation processes (resulting in a silica-rich crust, a mantle and an iron core), followed by weathering and deposition of concentrated silica-rich sediments (implying the body has or had an atmosphere in order to concentrate the silica by wind or water). An atmosphere that is too thick (such as on Venus) will impede tektite ejection. Given the presence of lunar rocks on Earth, it is theoretically possible to eject a tektite from the Moon and for it to land on the Earth. The main issue on the Moon, however, is the lack of suitable acidic silica-rich source material. Nonetheless, glass beads have been found in lunar soils on the moon, some of which are morphologically similar to, but chemically distinct from, tektites. Lunar spherules are typically basaltic (rarely acidic) in composition and often partly crystalline. Lunar spherules have both impact (of various magnitude) and volcanic origins. (Fulchignoni et al., 1971; Glass, 1976; Taylor, 1973). O'Keefe and Glass (1985) analysed an 8 mm diameter glass bead designated as lunar sample 14425 (derived from lunar sample 14163) from the Apollo 14 mission. Initially it was erroneously concluded that it resembled Australasian high-magnesium microtektites. Based on initial results, Glass (1986) carried out more detailed analyses and concluded that lunar sample 14425 is similar to Apollo 14 impact breccias and not to any known terrestrial tektite. Furthermore, crystallites / microlites were observed in the glass. It was concluded that the glass bead was formed by impact melting. This body should be termed a minikrystite. This case highlights how true microtektites are generically related to chemically more basic impact spherules found on both the Earth and on the Moon (Glass, 1972-a). The impact mechanism of formation is the same, but the source material is not: Tektites require an acidic silica-rich source rock. The author prefers to include Muong Nong-type layered ‘tektites’ as impact glasses. They are basically a continuation of the tektite formation sequence, but a marginally later stage where lower peak formation temperatures and pressures prevailed (Koeberl, 1986). These impact glasses are therefore not entirely homogenised, may contain microscopic relict mineral grains and have alternating layers of different composition. The bodies themselves are usually blocky and show no symmetrical form, although they may become water worn into rounded morphologies. It is important not to confuse genuine tektites containing stretched bubbles for layered tektites, which have distinct layering with glass of different composition. Some, but not all, Muong Nong-type layered ‘tektites’ contain mineral inclusions including zircon, baddeleyite (from the breakdown of zircon), quartz, chromite, rutile, monazite and corundum (Glass, 1970; Glass, 1972-b, Glass et al. 1990). Notably these are not products of crystallization (from the tektite glass), but represent shocked and incompletely melted crystals from the original sedimentary source rock (Glass and Barlow, 1979). Whilst there is a clear sequence and very close and continuous relationship between splashform tektites and Muong Nong-type layered ‘tektites’, the author prefers to consider the latter as an impact glass. True tektites are more homogenised and pure glassy materials, which formed at higher temperatures and often developed a symmetrical morphology (droplet) in the melt phase. Even true tektites do, however, contain relict grains in the form of ribbons of lechatelierite, which are sand or silt-sized grains of quartz that are incompletely homogenised into the glass. The boundary between a true tektite and an impact glass is somewhat subjective, but Muong-Nong-type layered impact glasses appear to cross the boundary. Glass (2000) considers microtektites to be, by definition, 'microscopic (<1 mm diameter) tektites which do not contain any crystalline phases (i.e. they do not contain crystallites / microlites)'. Trnka (pers. comm., 2012) noted that microtektites are 'considered to be predominantly condensates'. Elkins-Tanton (2002) consider microtektites to differ from macrotektites in that they are condensates as oppose to liquid melts, i.e. microtektites condensed from hot vapour plumes. Interestingly this study was based on bottle-green microtektites of unknown impact source. a) Lechatelierite particles (SiO2 ribbons formed from detrital quartz grains) would be expected in melts but not in condensates. b) Bubbles / vesicles would be expected in melts but should be absent from condensates (some phases may be removed by dissolution). c) Melts should contain spheres, dumbbells and teardrops (rotational forms) whereas condensates should be only spheres. d) Condensates should have lost a greater volatile content than melts. 2) Bottle-green of high-magnesium (HMg) microtektites. These two groups can also be compared with microkrystites, which are defined below. Microtektites are basically only found in the sea, notably the deep oceans. The high magnesium content of the alkaline sea water helps to preserve tektites. On land only exceedingly rare places, like the salt lakes of Australia, have the capability of preserving microtektites. Usually acidic rain waters will attack the alkaline component of the glass and destroy the smallest of tektites. 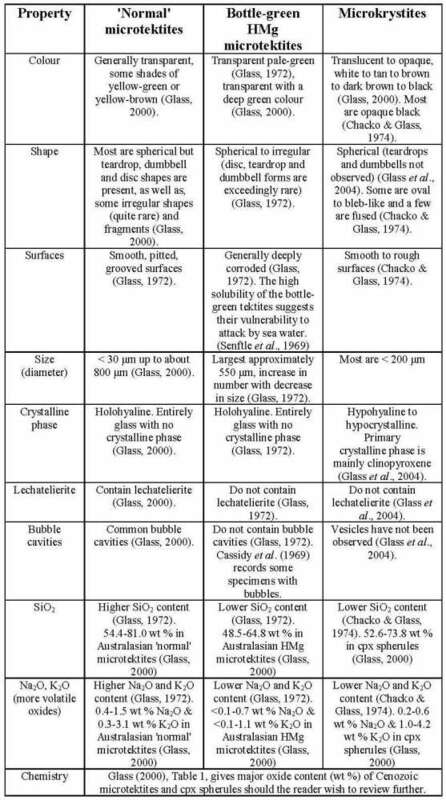 ABOVE: A table summarising the differences between 'normal' microtektites, bottle-green HMg microtektites and microkrystites. Microkrystites, which are considered most likely to be vapour condensates (Glass et al., 2004), are discussed in the next section. Their relevance is evident when one compares them with the bottle-green HMg microtektites. Both the bottle-green microtektites and microkrystites (cpx spherules) are smaller than 'normal' microtektites; are almost purely spherical (HMg tektites are only very rarely found as dumbbells or teardrops); neither contain lechatelierite; bubble cavities are typically not found; silica content is lower in both than 'normal' microtektites and both have a lower content of the more volatile oxides (Na2O, K2O). Chako & Glass (1974) comment: 'The clinopyroxene-bearing spherules are similar in composition to bottle-green, high-magnesium micro-tektites'. These features would logically lead one to believe that bottle-green HMg microtektites probably have a similar formation mechanism or origin to microkrystites. Bottle-green HMg microtektites may represent vapour condensates. 'Normal' microtektites, which have a greater size range; are found as spheres, dumbbells, teardrops and disc; contain lechatelierite; contain bubbles; on average have a higher silica content and volatile oxide (Na2O, K2O) content and compare very closely to macro-tektites are most likely melt derived. Microkrystites, also known as clinopyroxene (cpx) spherules, are impact generated spherules containing a primary crystalline phase, i.e. crystallites/microlites (Glass and Burns, 1987, 1988; Glass, 2000). The primary crystalline phase (which crystallised out during formation and is not a relict texture) is clinopyroxene, although other phases have also been observed (Glass and Burns, 1987). The crystalline textures include dendritic, feathery, bladed, skeletal and equant (Glass and Burns, 1987). Selected properties of microkrystites can be seen in Table 2.3. These spherules generally form from a more basic melt when compared to microtektites, but with silica contents generally ranging from 58 to 70 percent (Glass and Burns, 1987), which overlap with microtektite values. Glass et al. (2004) states: 'The presence of crystalline phases in the cpx spherules, but not in the Australasian, Ivory Coast, North American, and HSi cpx-related microtektites, is probably a result of the difference in major oxide compositions'. Indeed, a lower Al2O3 percentage, higher CaO and MgO percentage is clearly seen to separate the cpx spherules from the various microtektite groups in the Al2O3-CaO-MgO ternary diagam in Figure 6 of Glass et al. (2004). It was noted by Glass and Burns (1987, 1988) that microkrystites are associated with iridum anomalies, whereas microtektites are not. Schmidt et al. (1993), however, demonstrated that an irdium anomaly was associated with the Australasian microtektites. Glass and Burns (1987, 1988) also note that and that microkrystites are all late Eocene or older whereas microtektites are all late Eocene or younger. Glass et al. (2004) state that there are several lines of evidence that microkrystites were not formed as melt droplets, but by condensation from a vapour. A more general term is the all-encompassing ‘impact spherule’. This term is good to apply to pseudomorphs of tektites or wholly ‘devitrified’ forms such as those found at the Cretaceous-Tertiary boundary. The term impact spherule is typically applied to small bodies, but is not strictly defined by size. If uncertainty exists in the origin of the spherule it is better to simply use the term ‘spherule’.